I have a hermit that I accidentally found molting, when I picked him up he fell halfway out of his shell. I put him back here I found him and covered him up again. he has recently surfaced, but is not moving. I asked my kid (12yo) if he moved him and he has said no. Is it common for them to resurface without molting? He seems sickly and not moving. I am just worried hes too stressed. The other crabs are not messing with him. Could you please fill this out for us? Ty! no, but I got them from a lady who never had them and never gave them anything for humidity. zoo med food. occasional fresh fruit. I remove the fruit less than a day after and replace the others every other day. The crabs are about 7 years old and I do not know what species. Dry Tank, 40 gallon and the lid is wooden with ventilation when needed. I will wipe down the sides and spot clean. Yes they are. I just rinse them in the sink. no, I did have to replace a heating pad. I have a hermit that I accidentally found molting, when I picked him up he fell halfway out of his shell. I put him back here I found him and covered him up again. he has recently surfaced, but is not moving. I asked my kid (12yo) if he moved him and he has said no. Is it common for them to resurface without molting? He seems sickly and not moving. I am just worried hes too stressed. Curly: Substrate needs to be at least 6 inches deep, or three times as deep as your largest crab, whichever is deeper. For the size of your crabs, you need much deeper substrate. It needs to be moist enough to hold it's shape, but not dripping water. Many of us use a 5 to 1 ratio of playsand to eco earth. Curly: You must buy a thermometer and hygrometer. Crabs need humidity around or over 80% to breathe. Digital are more accurate than analog. Temperatures need to be around 80 as well. Curly: Do you mean under tank heaters? Even though they are called 'under tank', they must be mounted on the sides or back of the tank. Some types can be insulated over, but not all of them. Curly - What brand of dechlorinator are you using in what type of fresh water? What brand of salt? If you are using pre-mixed salt water, it is probably not good for crabs, even if it is marketed as such. Curly - Commercial food is not good for crabs, even if it says it is for hermit crabs. Check out the food and nutrition section of the site for information on proper foods. Calcium and protein are needed daily. Curly - a wooden lid is eventually going to either mold or break down. Curly - you need to order shells asap. There should be 3-5 shells PER crab. Check out the 'shells' section for proper shells to buy. Curly - Throw out the sponges. They are not needed, and only grow bacteria. 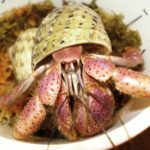 Curly - With proper tank conditions, crabs should dig underneath the substrate and stay there until they come up from their molt. Do not dig up crabs unless extreme circumstances (ie- flood or bacterial bloom). Do not re-bury a crab. When they dig down, they make their own cave, and if re-buried, they won't have the cave and could suffocate. You are lucky he was able to resurface. He should be isolated from the other crabs, so they can not prey on him. You can iso him in the main tank, cut a 2L pop bottle to put around him, leave the lid off so he has heat/ humidity from the tank. He will need a small bottle cap of both salt and fresh waters, calcium, and protein. If his exoskeleton was with him when you found him, you need to put that in there with him as well. You have some improvements that you can make in your tank to give your crabs the best chance at survival. Last edited by curlysister on Wed Jan 16, 2019 12:39 pm, edited 1 time in total. I did not mean to dig him up. What could I do to improve my tank? Curly replied to each of your answers from the emergency template with how you can improve your tank and what the conditions should be. I made my replies in bold now, so they are easier to see. ok thank you. I will figure it out. 7 years is an amazing amount of time! Unfortunately the little things catch up with them eventually, and I think that's what happened here. The older and bigger they get, the harder it is to get through a molt in not so ideal conditions, or to stay okay when too cold or dry. It's going to be really hard to say if he'll recover or not. Making sure he is warm and humid and isolated and well fed is the best chance he'll have. Once they start showing signs of illness it's often too far along to reverse, sadly.